Project management is the practice of initiating, planning, executing, controlling, and closing the work of a team to achieve specific goals and meet specific success criteria at the specified time. A project is a temporary endeavor designed to produce a unique product, service or result with a defined beginning and end (usually time-constrained, and often constrained by funding or staffing) undertaken to meet unique goals and objectives, typically to bring about beneficial change or added value. The temporary nature of projects stands in contrast with business as usual (or operations), which are repetitive, permanent, or semi-permanent functional activities to produce products or services. In practice, the management of such distinct production approaches requires the development of distinct technical skills and management strategies. The primary challenge of project management is to achieve all of the project goals within the given constraints. This information is usually described in project documentation, created at the beginning of the development process. The primary constraints are scope, time, quality and budget. The secondary — and more ambitious — challenge is to optimize the allocation of necessary inputs and apply them to meet pre-defined objectives. The object of project management is to produce a complete project which complies with the client’s objectives. In many cases the object of project management is also to shape or reform the client’s brief in order to feasibly be able to address the client’s objectives. Once the client’s objectives are clearly established they should impact on all decisions made by other people involved in the project – project managers, designers, contractors, sub-contractors, etc. If the project management objectives are ill-defined or too tightly prescribed it will have a detrimental effect on decision making. Until 1900, civil engineering projects were generally managed by creative architects, engineers, and master builders themselves, for example, Vitruvius (first century BC), Christopher Wren (1632–1723), Thomas Telford(1757–1834) and Isambard Kingdom Brunel (1806–1859). In the 1950s organizations started to systematically apply project-management tools and techniques to complex engineering projects. As a discipline, project management developed from several fields of application including civil construction, engineering, and heavy defense activity. Two forefathers of project management are Henry Gantt, called the father of planning and control techniques, who is famous for his use of the Gantt chart as a project management tool (alternatively Harmonogram first proposed by Karol Adamiecki); and Henri Fayol for his creation of the five management functions that form the foundation of the body of knowledge associated with project and program management. Both Gantt and Fayol were students of Frederick Winslow Taylor‘s theories of scientific management. His work is the forerunner to modern project management tools including work breakdown structure (WBS) and resource allocation. The 1950s marked the beginning of the modern project management era where core engineering fields come together to work as one. Project management became recognized as a distinct discipline arising from the management discipline with engineering model. In the United States, prior to the 1950s, projects were managed on an ad-hoc basis, using mostly Gantt charts and informal techniques and tools. At that time, two mathematical project-scheduling models were developed. The “critical path method” (CPM) was developed as a joint venture between DuPont Corporation and Remington Rand Corporation for managing plant maintenance projects. The “program evaluation and review technique” (PERT), was developed by the U.S. Navy Special Projects Office in conjunction with the Lockheed Corporation and Booz Allen Hamilton as part of the Polaris missile submarine program. In 1969, the Project Management Institute (PMI) was formed in the USA. PMI publishes A Guide to the Project Management Body of Knowledge (PMBOK Guide), which describes project management practices that are common to “most projects, most of the time.” PMI also offers a range of certifications. The incorporation of process-based management has been driven by the use of maturity models such as the OPM3 and the CMMI (capability maturity model integration; see this example of a predecessor) and ISO/IEC 15504 (SPICE – software process improvement and capability estimation). Unlike SEI’s CMM, the OPM3 maturity model describes how to make project management processes capable of performing successfully, consistently, and predictably in order to enact the strategies of an organization. Earned value management (EVM) extends project management with techniques to improve project monitoring. It illustrates project progress towards completion in terms of work and value (cost). Earned Schedule is an extension to the theory and practice of EVM. In project environments with a significant exploratory element (e.g., research and development), these stages may be supplemented with decision points (go/no go decisions) at which the project’s continuation is debated and decided. An example is the Phase–gate model. After the initiation stage, the project is planned to an appropriate level of detail (see example of a flow-chart). The main purpose is to plan time, cost and resources adequately to estimate the work needed and to effectively manage risk during project execution. As with the Initiation process group, a failure to adequately plan greatly reduces the project’s chances of successfully accomplishing its goals. While executing we must know what are the planned terms that need to be executed. The execution/implementation phase ensures that the project management plan’s deliverables are executed accordingly. This phase involves proper allocation, co-ordination and management of human resources and any other resources such as material and budgets. The output of this phase is the project deliverables. Documenting everything within a project is key to being successful. In order to maintain budget, scope, effectiveness and pace a project must have physical documents pertaining to each specific task. With correct documentation, it is easy to see whether or not a project’s requirement has been met. To go along with that, documentation provides information regarding what has already been completed for that project. Documentation throughout a project provides a paper trail for anyone who needs to go back and reference the work in the past. In most cases, documentation is the most successful way to monitor and control the specific phases of a project. With the correct documentation, a project’s success can be tracked and observed as the project goes on. If performed correctly documentation can be the backbone to a project’s success. Monitoring and controlling consists of those processes performed to observe project execution so that potential problems can be identified in a timely manner and corrective action can be taken, when necessary, to control the execution of the project. The key benefit is that project performance is observed and measured regularly to identify variances from the project management plan..
Over the course of any construction project, the work scope may change. Change is a normal and expected part of the construction process. Changes can be the result of necessary design modifications, differing site conditions, material availability, contractor-requested changes, value engineering and impacts from third parties, to name a few. Beyond executing the change in the field, the change normally needs to be documented to show what was actually constructed. This is referred to as change management. Hence, the owner usually requires a final record to show all changes or, more specifically, any change that modifies the tangible portions of the finished work. The record is made on the contract documents – usually, but not necessarily limited to, the design drawings. The end product of this effort is what the industry terms as-built drawings, or more simply, “as built.” The requirement for providing them is a norm in construction contracts. Construction document management is a highly important task undertaken with the aid an online or desktop software system, or maintained through physical documentation. The increasing legality pertaining to the construction industry’s maintenance of correct documentation has caused the increase in the need for document management systems. For each type of project management, project managers develop and utilize repeatable templates that are specific to the industry they’re dealing with. This allows project plans to become very thorough and highly repeatable, with the specific intent to increase quality, lower delivery costs, and lower time to deliver project results. The United States Department of Defense states; “Cost, Schedule, Performance, and Risk,” are the four elements through which Department of Defense acquisition professionals make trade-offs and track program status. There are also international standards. Risk management applies proactive identification (see tools) of future problems and understanding of their consequences allowing predictive decisions about projects. The work breakdown structure (WBS) is a tree structure that shows a subdivision of the activities required to achieve an objective—for example a program, project, and contract. The WBS may be hardware-, product-, service-, or process-oriented (see an example in a NASA reporting structure (2001)). 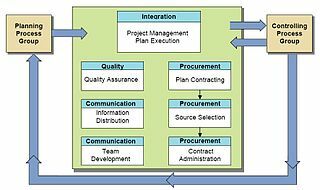 The work breakdown structure provides a common framework for the natural development of the overall planning and control of a contract and is the basis for dividing work into definable increments from which the statement of work can be developed and technical, schedule, cost, and labor hour reporting can be established. The work breakdown structure can be displayed in two forms, as a table with subdivision of tasks or as an organisational chart whose lowest nodes are referred to as “work packages”. ISO 21500:2012 – Guidance on project management. This is the first project management ISO. ISO 31000:2009 – Risk management. Risk management is 1 of the 10 knowledge areas of either ISO 21500 or PMBoK5 concept of project management. Total Cost Management Framework, AACE International’s Methodology for Integrated Portfolio, Program and Project Management. Australian Institute of Project Management (AIPM) has 4 levels of certification; CPPP, CPPM, CPPD & CPPE for Certified Practicing Project … Partner, Manager, Director and Executive. Jump up^ “What is Project Management?”. Project Management Institute. Retrieved 2014-06-04. Jump up^ Paul C. Dinsmore et al (2005) The right projects done right! John Wiley and Sons, 2005. ISBN 0-7879-7113-8. p.35 and further. Jump up^ Cattani, G.; Ferriani, S.; Frederiksen, L.; Florian, T. (2011). Project-Based Organizing and Strategic Management. Advances in Strategic Management. 28. Emerald. ISBN 1780521936. Jump up^ Joseph Phillips (2003). PMP Project Management Professional Study Guide. McGraw-Hill Professional, 2003. ISBN 0-07-223062-2 p.354. Jump up^ Morgen Witzel (2003). Fifty key figures in management. Routledge, 2003. ISBN 0-415-36977-0. p. 96-101. Jump up^ Malcolm, D. G., Roseboom, J. H., Clark, C. E., & Fazar, W. (1959). “Application of a technique for research and development program evaluation.” Operations research, 7(5), 646-669. Jump up^ F. L. Harrison, Dennis Lock (2004). Advanced project management: a structured approach. Gower Publishing, Ltd., 2004. ISBN 0-566-07822-8. p.34. Jump up^ Mesly, Olivier. (2017). Project feasibility – Tools for uncovering points of vulnerability. New York, NY: Taylor and Francis, CRC Press. 546 pages. ISBN 9 781498 757911. Jump up^ Wysocki, Robert K (2013). Effective Project Management: Traditional, Adaptive, Extreme (Seventh Edition). John Wiley & Sons. ISBN 978-1118729168. Jump up^ Winston W. Royce (1970). “Managing the Development of Large Software Systems” Archived 2016-03-15 at the Wayback Machine. in: Technical Papers of Western Electronic Show and Convention (WesCon) August 25–28, 1970, Los Angeles, USA. ^ Jump up to:a b Stellman, Andrew; Greene, Jennifer (2005). Applied Software Project Management. O’Reilly Media. ISBN 978-0-596-00948-9. Archived from the original on 2015-02-09. Jump up^ Hass, Kathleen B. (Kitty) (March 2, 2010). “Managing Complex Projects that are Too Large, Too Long and Too Costly”. PM Times. Retrieved 2017-06-27. Jump up^ Conforto, E. C.; Salum, F.; Amaral, D. C.; da Silva, S. L.; Magnanini de Almeida, L. F (June 2014). “Can agile project management be adopted by industries other than software development?”. Project Management Journal. 45 (3): 21–34. doi:10.1002/pmj.21410. Jump up^ Patel, Himanshu (April 20, 2018). “The Waterfall Model In Project Management Explained”. ItsGuru. Retrieved 2017-04-20. Jump up^ Snowden, David J.; Boone, Mary E. (November 2007). “A Leader’s Framework for Decision Making”. Harvard Business Review. Retrieved 2017-06-27. Jump up^ “Stanford Research Study Finds Innovation Engineering is a true “Breakout Innovation” System”. IE News. June 20, 2017. Retrieved 2017-08-11. Jump up^ McCaffer, Ronald; Harris, Frank (2013). Modern construction management. Wiley-Blackwell. p. 5. ISBN 1118510186. OCLC 834624541. Jump up^ Serra, C. E. M.; Kunc, M. (2014). “Benefits Realisation Management and its influence on project success and on the execution of business strategies”. International Journal of Project Management. 33 (1): 53–66. doi:10.1016/j.ijproman.2014.03.011. ^ Jump up to:a b c d e f “Project Management Guide” (PDF). VA Office of Information and Technology. 2003. Archived from the original on January 14, 2009. Jump up^ Peter Nathan, Gerald Everett Jones (2003). PMP certification for dummies. p.63. Jump up^ Harold Kerzner (2003). Project Management: A Systems Approach to Planning, Scheduling, and Controlling (8th ed.). Wiley. ISBN 0-471-22577-0. Jump up^ “Project Management planning activities Guide”. 2013-06-14. Jump up^ Jörg Becker, Martin Kugeler, Michael Rosemann (2003). Process management: a guide for the design of business processes. ISBN 978-3-540-43499-3. p.27. Jump up^ Bernhard Schlagheck (2000). Objektorientierte Referenzmodelle für das Prozess- und Projektcontrolling. Grundlagen – Konstruktionen – Anwendungsmöglichkeiten. ISBN 978-3-8244-7162-1. p.131. Jump up^ Josef E. Riedl (1990). Projekt – Controlling in Forschung und Entwicklung. ISBN 978-3-540-51963-8. p.99. Jump up^ Abdou, Saed M; Yong, Kuan; Othman, Mohammed (2016). “Project Complexity Influence on Project management performance – The Malaysian perspective”. MATEC Web of Conferences. 66. doi:10.1051/matecconf/20166600065. ISSN 2261-236X. Jump up^ Ludovic‐Alexandre Vidal, Franck Marle, Vidal (2008). “”Understanding project complexity: implications on project management”,”. Kybernetes. 37 (8): 1094–1110 – via Emerald Insight. Jump up^ G., Morris, Peter W. (1994). The management of projects. London: T. Telford. p. 317. ISBN 0727725939. OCLC 30437274. Jump up^ Gower handbook of people in project management. Lock, Dennis., Scott, Lindsay, 1974-. Farnham, Surrey: Gower Publishing. 2013. p. 398. ISBN 140943785X. OCLC 855019788. Jump up^ “PMOs”. http://www.theprojectmanager.co.za. Retrieved 2018-03-01. Jump up^ Commission, Australian Public Service; Commission, Australian Public Service. “APS framework for optimal management structures”. Retrieved 2018-03-01. Jump up^ “Certified Construction Manager”. CMAA. Retrieved 23 November2013. Jump up^ “Certificate in Biotechnology Project Management”. University of Washington. Retrieved 23 November 2013. Jump up^ Esselink, Bert (2000). A Practical Guide to Localization. Amsterdam/Philadelphia: John Benjamins Publishing Company. p. 428. ISBN 978-9-027-21956-5. Jump up^ What Is Risk Management? Jump up^ “DoDD 5000.01” (PDF). United States Department of Defense. Retrieved 20 November 2007. ^ Jump up to:a b NASA NPR 9501.2D. May 23, 2001. Jump up^ PMBOK 4h Ed. p. 443. ISBN 978-1933890517. Jump up^ Curlee, Wanda (2011). The Virtual Project Management Office: Best Practices, Proven Methods. Jump up^ Khazanchi, Deepak (2005). Patterns of Effective Project Management in Virtual Projects: An Exploratory Study. Project Management Institute. ISBN 9781930699830. Archived from the original on 2013-10-23. Retrieved 2013-10-22. Jump up^ Velagapudi, Mridula (April 13, 2012). “Why You Cannot Avoid Virtual Project Management 2012 Onwards”.